ONE. Some ranches offer "hunts" held in corrals or pens or paddocks. We differ with those bison producers, as to the ethics of such "canned hunts." Our animals live out their entire lives in large pastures on our 4,400 acre ranch. We aim to give hunters a bona fide hunt in the field. We will not arrange a corral shoot, and we turn away anyone who asks for one. TWO. Bison ranches that are geared primarily toward meat production frequently cull their poorer specimens to use as hunt animals. But hunting is our Number One priority. We view our entire herd's annual production of yearly bulls as hunting stock. And we will not let a hunter shoot an animal we wouldn't take ourselves. THREE. Many bison ranches ear-tag the animals they offer for hunts. Some say this aids in tracking wounded bison. Others are virtual hunt-by-numbers operations. Whatever the stated reason, we find hunting ear-tagged bison aesthetically distasteful. The animals we designate for hunting are not ear-tagged. FOUR. Unlike those bison hunting operations that require you to take an animal within a short time-frame (e.g., ninety minutes) in order to accommodate as many hunters a day as they can, Crazy Woman gives any hunting party of up to three hunters an entire day to complete their kills. We do not schedule more than one party per day, unless we have their prior permission. We never schedule more than three hunters in a day. FIVE. Some bison hunts require additional payment for the meat. Others limit the amount of meat hunters can take home with them. At Crazy Woman, every hunt price includes the head, the hide, and all the great meat. In addition, our enlightened state of Montana lacks the general sales tax hunters in most other states must pay. SIX. There are bison ranches offering hunts in parts of the country in which bison are not native and do not thrive. Not only is the ambiance wrong. These bison are frequently underweight and lack proper conformation. 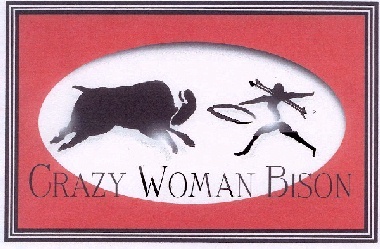 The Crazy Woman Bison Ranch, with its High Plains location, is at the epicenter of the traditional bison range. Our animals flourish on the same hard grass prairie that their ancestors did thousands of years ago. And our hunters walk the same ground as the original bison hunters of North America. SEVEN. Most bison ranches that offer hunts do it more or less as an afterthought and/or a secondary source of income. 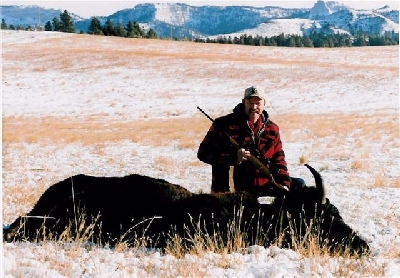 We at Crazy Woman see hunting as a primary way to expand and maintain the bison's ecological niche on the Great Plains. Because we care about the land as much as we do the buffalo, we reinvest a significant portion of the income we derive from bison hunts in a wide variety of wildlife habitat improvement projects on the ranch. EIGHT. Many ranches offering bison hunts treat buffalo as if they were cattle. They incorporate aspects of the cattle industry that environmentalists and hunter-naturalists are finding increasingly distasteful: de-horning, branding, antibiotics, growth enhancers, feed lots, artificial weaning, and so on. At Crazy Woman Ranch, we don't employ any of these methods of the meat industry. We simply don't. NINE. 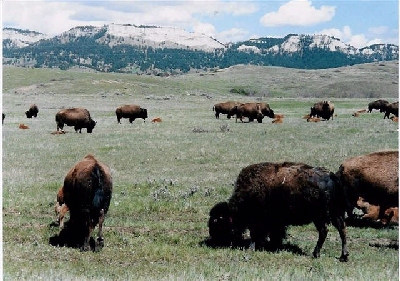 Many bison ranches feed buffalo as if they were cattle. They give them various supplements they don't need and "finish" them on heavy doses of grain. The Crazy Woman bison has been fed on our grass and our grass hay since birth, has never received any feed supplements other than minerals, salt, and limited amounts of grain-based feed cake, and has never been inoculated with antibiotics, hormones or insecticides. The meat from our animals is totally natural. TEN. Unlike the many bison hunt operations that focus their advertising and publicity on expensive trophy bulls, we feel our main constituency is the sportsman and sportswoman who wants an affordable, enjoyable hunt in beautiful, western scenic surroundings. We therefore offer solely hunts for yearling bulls at a competitive and cost effective price. That's the Crazy Woman Bison Experience. We would love to share it with you.